Rio's legacy: Karen and Ryan fight to keep the memory of Rio alive. Rio James Fowler liked cuddles. A lot, in fact. He needed few things to keep him with a big, wide grin from cheek to cheek. He loved to be fed, and then he loved to be cuddled. Other than that, his mum says, he would be a happy little kid. With fair hair and big, bright eyes, Rio was the quintessential second-born with a soft nature, laid-back humour and an expressive face that adults couldn’t help but giggle at. For the 17 months he spent on this earth, Rio loved to play with his sister, Remi, and be around his two parents Ryan and Karen. "Rio was a pretty healthy baby," both Karen and Ryan tell Mamamia over the phone from their Sydney home. "He did have a few complications - for example, he was born with a shorter leg, but no one could ever quite work out what was wrong with it. "Our doctors knew some stuff about him... there were always a few question marks, but no one every thought anything was deadly or dangerous or anything like that," Karen says. "Up until November last year, we thought we had a perfectly healthy baby boy." On the third of November last year, Rio&apos;s elder sister Remi came home from Kinder with gastro. She is physically resilient, her dad says, so after a little vomit and a few hours, she was fine. Her little brother wasn&apos;t so lucky. "He was a little bit off all day, and then he had a big projective vomit and we had never seen that before. That was the start of the downward path, we just didn&apos;t know it at the time," Ryan recalls. Immediately, Ryan and Karen took him to the emergency room. After a couple of hours, Rio perked up and was sent home. A few days later, they took him back to the emergency room. After a little while, Rio perked up again and was sent home. The next day, Karen took him back. Call it maternal instinct, but although her little, fierce, strong boy was "up and about", he wasn&apos;t fine, that much she knew. And so began a harrowing period of hope and despair and hope and despair for the Fowler family, their lives on hold while their littlest one clutched onto his life with his tiny hands and fierce will. "When we look back of photos then - at the time I thought, sweet, he looks up and about - but when you look back at the photo, he didn&apos;t look well. He was yellow, gaunt ... just a little kid who was trying to persevere over the top of it all," Karen says. It was during that third visit to the ED that both Karen and Ryan realised they weren&apos;t just dealing with a little boy and gastro anymore. They knew Rio was consumed by something far more serious. That evening, his blood pressure shot up to 225/150. His heart rate was at 214 beats per minute. "Then," Ryan says, "the roller coaster ride started for us." "We went from thinking it was gastro, to be told he may not make it through the night. The doctors told us their focus was getting through the next six hours." "How do you let people know?" Ryan says. "How do tell your friends and family that. We thought that was the worst. He survived the night, but it only got worse." Over the next month or so, Rio underwent four major surgeries (including two amputations), renal failure, heart impairment and consistently high blood pressure. He was - after so many invasive, lifesaving operations - diagnosed with an aterial vasculopathy condition. His gastro symptoms, doctors believed, accelerated an underlying condition that most had had never seen before. 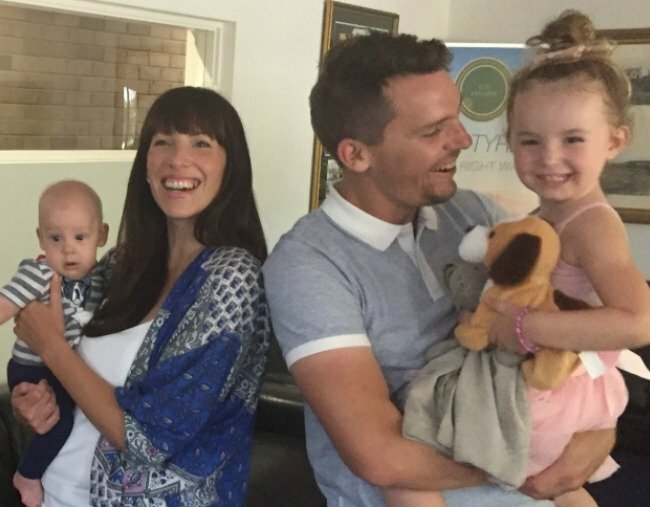 Just before Christmas, doctors told Ryan and Karen that there was nothing more they could do for Rio. "They came and told us, &apos;We don&apos;t think there is anything else we can do for your boy&apos;. We went into palliative care, but the doctors said, &apos;We don&apos;t know how long your son has got left&apos;. "We had been living day by day. It&apos;s not like they could give us a timeline, they told us it could be one day or it could be 10 years." Not only were Karen and Ryan facing their son&apos;s death after having just 17 months to hold him and feed him and cuddle him, they had no sense of when they would be saying goodbye. So how in the world can you handle your son&apos;s impending mortality when he isn&apos;t yet two, with no idea how long you have left to hold his little fingers and look into his bright eyes? "We&apos;re a Christian family," Ryan says, "we rely a lot on our faith, but it&apos;s tough because naturally you just want to save your boy, you feel so helpless. We have nothing but praise for the Sydney Hospital of Randwick, what they did for us and our boy was amazing." For Karen, there&apos;s nothing you can do to "wrap your head around it". "You always want to ask the doctors, &apos;Are you sure he is dying?&apos; They were great at reminding us at why we weren&apos;t doing the wrong thing and at reminding us all Rio had been through with the general anaesthetics, and operations and the pain he was in. "Every second he felt OK - and despite us sitting there in our overwhelmed emotional state - he would look at me and ask for his truck. He wouldn&apos;t mope. He would just want to play. He was a child trying to live every second of his life and we had to remind ourselves, let&apos;s not get bogged down in the emotion." A day or two before Rio passed away, Karen and Ryan took him out of their stay at Bear Cottage - the only children&apos;s hospice in NSW - and wandered down to the beach. "We took him down to the beach the day before he died, he just loved being outside. I was able to stand with him at the water. We were in the ocean, he was sitting on mummy in the sun and we were people watching. Those moments were so precious were because of that place [Bear Cottage]. His life was made so much richer," Karen recalled. On January 15, Rio passed away, but not without surviving for eight days beyond doctor&apos;s predictions with nothing but some pain medication spurring him along. In the four weeks since he died, Ryan and Karen have sought to make Rio’s journey worthwhile. They started Rio&apos;s Legacy on GoFundMe to assist and provide practical care, improved facilities and support to and for children and their families who have been diagnosed with a life limited disease. "I wanted to do something, it was my way of coping," Ryan says. "It won&apos;t be easy doing in this way. We got hit with a tidal wave with our son, but we got to see parents and families kids who are 10 years old who have been doing this for years. "As a father and a parent, I know it&apos;s raw, I don&apos;t have that opportunity to teach him how to ride a bike or to face forward, but this is one way I can do something with him." Ryan and Karen&apos;s voices are filled with the fierce determination they so often describe was inherent in their son. Their fight - so soon after the death of the boy they loved so much - speaks to how resolute they are to change the world for the better, all in the name of their son. And for that, Rio&apos;s legacy will exist far beyond the fundraiser in which his parents seek to foster. It lives in their gracious fight to keep his memory and spirit and expressive cheeks alive in a world that took him early. To donate to Rio&apos;s legacy on GoFundMe, click here.